Please link to this page instead of copying because I will be regularly updating this table with new radios and new data. If you spot any errors or out of date information or if you have more information to add, please leave a comment below or send me an email. Check contact page for details. Anything with a ? in is something I don't know. If you do, then please help by telling me. If I have missed out any Chinese DMR radios please tell me in the comments. Information in this table is not guaranteed. I have made my best effort to provide correct information but there could be errors. Please check before buying, and if you find a mistake please let me know! This comparison is made for licensed amateur radio operators. It is illegal to use any of these radios on licence free channels such as PMR446 or FRS (including GMRS). 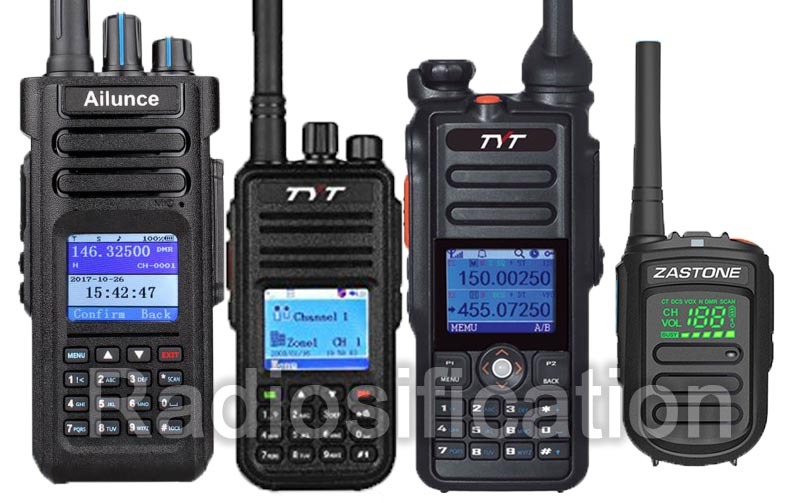 Radios used on FRS and GMRS must be certified for use on these channels by the FCC. Radios used on PMR446 must have 0.5W maximum output power, and a fixed antenna. First look at the new Ailunce HD1! This is a pretty exciting radio as it's the first radio I know of to be made specifically for amateurs. It has a VFO or frequency mode so you can just type in the frequency without having to enter it into a channel, unlike other DMR radios which were made for the commercial market.